What is the best way to utilize waste from food? The production of heat and power from food waste is standard practice in the Nordic countries today, but there is also growing need for organic material suitable for producing transport fuels. So what is the potential for producing biofuels from Nordic food waste? Food waste is gaining increased attention among consumers and policy makers globally. The European Commission has stated that wasting food is not only an ethical and economic issue, but that it also depletes the environment of limited natural resources. Prevention, or at least reduction, is usually presented as the most desirable strategy to addressing the problem of food wastage. However, there is also pressing need for rapid phaseout of fossil fuels as part of wider efforts to reduce climate emissions. Emissions from the transport sector account for a large share of the Nordics’ overall emissions, and as such reducing these emissions is a crucial part of efforts to cut emissions in the region. In this context, utilising food waste as a source of renewable energy with lower net emissions that fossil fuels becomes a more appealing prospect. Together Sweden, Denmark, Norway, Finland and Iceland generate around 10 million tons of food waste every year, and roughly half of this waste (5 million tons annually) originates from households. In addition, some 25 million tons of cereal straw is generated in the Nordic countries, of which less than 10 million tons is estimated to available for utilization. Almost 90% of food waste generated in the Nordic countries is currently collected and utilized, mainly for energy. However, there are other sources of biomass, normally not utilized. This includes 25 tons of cereal straw, (significant amounts in Denmark), cooking oil, and waste from fisheries that are not brought ashore (83% of the uncollected biomass). Incineration, biogas and food/feed are the currently the most significant end uses of food waste, followed by composting (see figure). 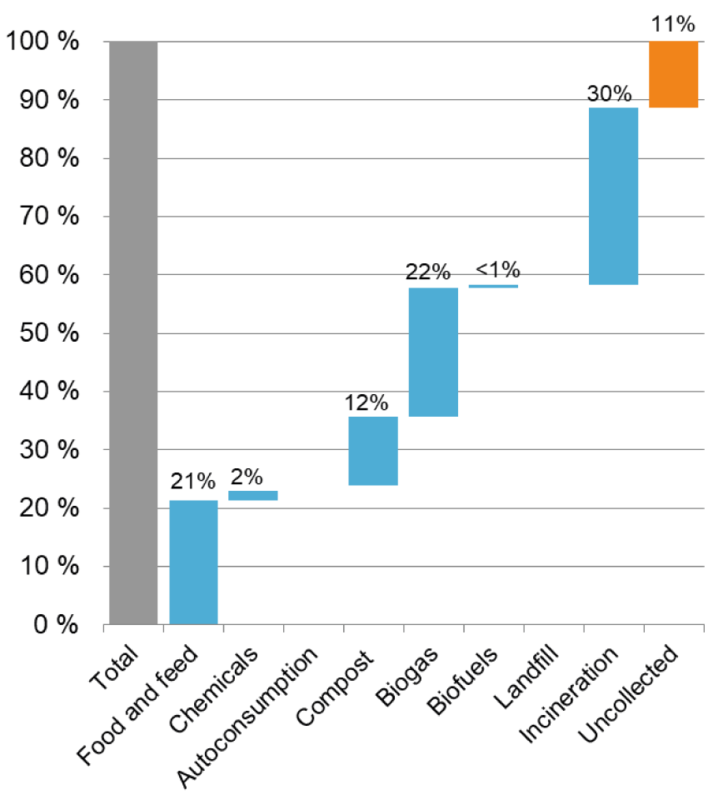 Utilization of food waste for transport fuels, excluding biogas, is still relatively small i.e. less than 1% of the total volume of food waste generated (see figure). There is a potential to multiply the amount of Nordic food waste to transport biofuels. This can be done by redirection of waste volumes from incineration (currently 30% of the food waste) to biofuels. It can also be done by collecting biomass currently not utilized (11% of food waste). This includes waste from fisheries and aquaculture, cereal straws and used cooking oil and rendering waste. This can be processed into transport fuels, either as biogas or liquid biofuel. The technologies are available and already in use in all the Nordic countries. A system to sort and separately collect food waste from the households is a major challenge to reach this potential. And this fraction has to be replaced by other energy sources for heat and power production. Coordination of the biofuels policy priorities between the Nordic Countries would be beneficial for industry and consumers of biofuels. 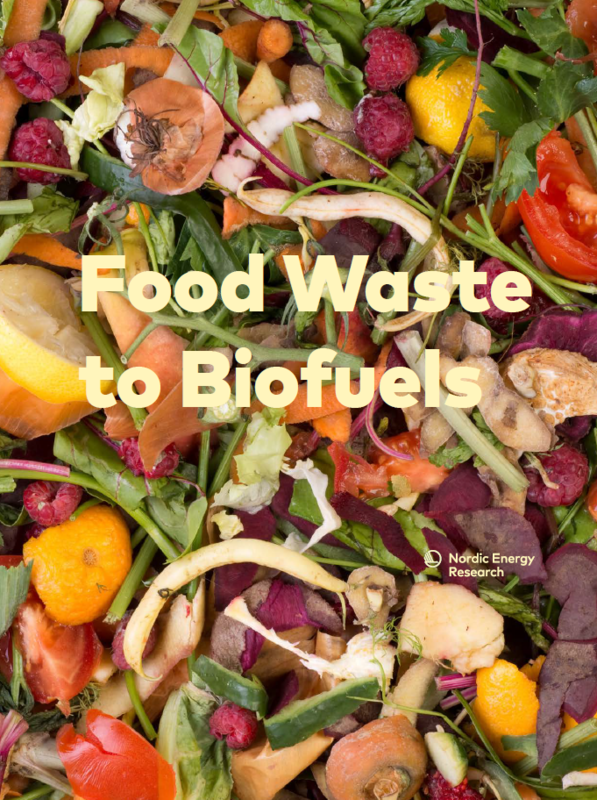 Download the full report “Food Waste to Biofuels” here.